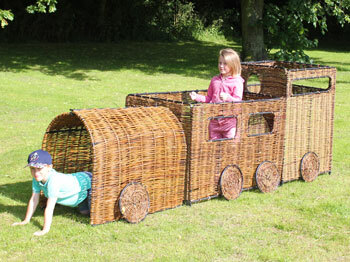 Encourage children to use their imagination with this fantastic Wicker train set. Perfect for group activities - All Aboard! For indoor and outdoor use, the set includes 10 pieces (panels) and 8 wheels in total - cable ties are included.  Our Wicker range is hand woven onto metal frames for extra stability.  All units are supplied flat packed with sturdy ties for simple assembly. 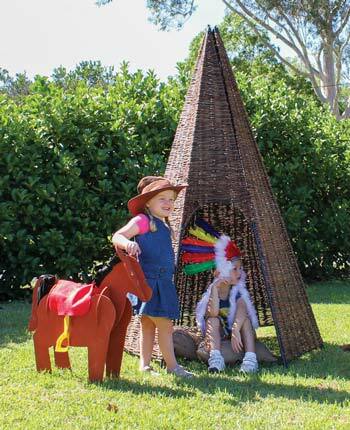  Children can use their imagination to be the Captain or part of the crew with this wicker ship!  Perfect for outdoor and indoor role play.  A range of hand woven Wicker products to create beautiful settings for outdoor play or nature areas.  All products also include plastic feet to allow indoor use.  1200 x 1200 x 1600mm.  This Wicker hut comprises 3 plain wall panels, 2 window panels and 1 door panel plus 6 roof panels to create a natural hideaway environment for children. 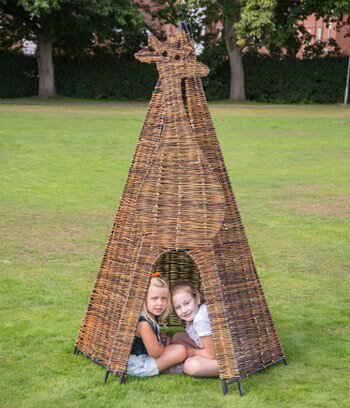  A 6 panel Wicker TeePee for children to crawl inside to use as a den or hideaway. 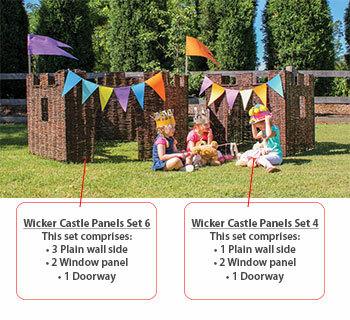  This set comprises: 1 plain side, 2 window panel plus 1 doorway panel for children to create their own outdoor castle.  This set includes 6 wicker animal panels. These panels show a crocodile, giraffes, a hippo, an elephant, a lion and a monkey. 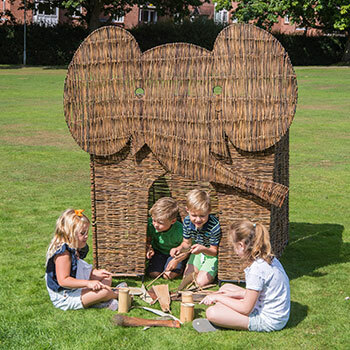  An Elephant Wicker Hut for children to crawl inside to use as a den or hideaway.  1950 x 1200 x 1200mm. 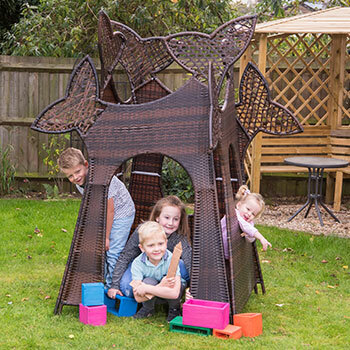  A Giraffe Wicker Hut for children to crawl inside to use as a den or hideaway. 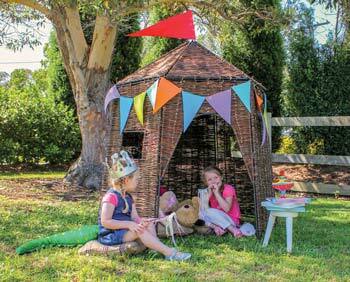  Create a magical enchanted village with this new Rattan range. 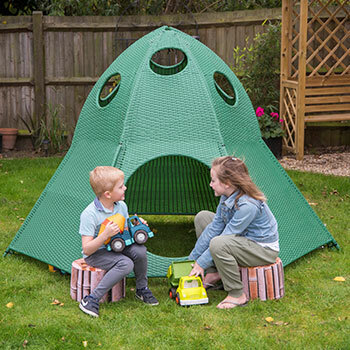  Ideal for outdoor play. 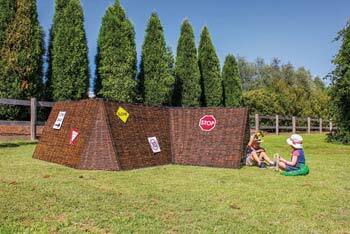  Manufactured from strong synthetic wicker suitable for outdoor use.  Durable powder coated stainless steel frame with protective rubber stoppers.  2110 x 1525 x 1750mm. 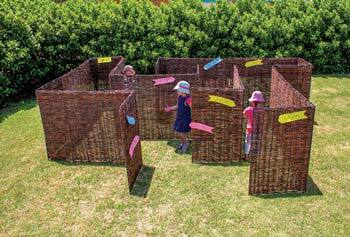  A set of 18 panels in two sizes so children can create their very own labyrinth of pathways with many twists and turns. Dimensions: Set comprises 8 panels 1.5 x 1.2 metre and 10 panels 75cm x 1.2 metres. 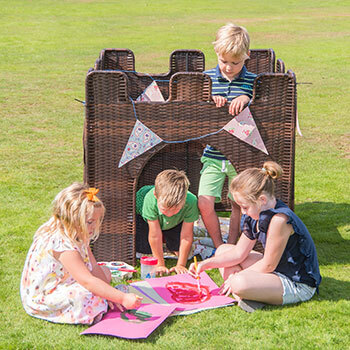  A set of 8 wicker panels to create 3 interlinking crawl through tunnels for children to discover and explore.  Set comprises 6 large panels and 2 triangular panels. 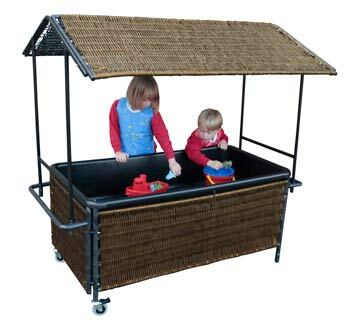 A large sturdy sand and water tray built into a hand woven wicker stand, to create a beautiful setting for outdoor or nature areas. The wicker is hand woven onto metal frames for extra stability. The stand includes two sturdy outdoor castors, and a water release valve on the bottom of the tray. The unit also includes a hand woven wicker roof to provide protection from the elements.  (L)1400 x (W)640 x (H)1500mm when assembled.  These Large Bamboo Sticks are ideal for both indoor and outdoor play.  Perfect for early and primary years.  Lightweight bamboo is naturally strong and an excellent resource.  Try and keep your bamboo happy by wiping down on a regular basis after use.  When storing away for long periods, store in a dry area but not in a room with high temperature or in the sun.  Excessive drying will cause large cracks.  Each pole measure (L): 1800mm.